After selecting a page, select the Child Pages tab to display any child pages for the current page. Click and hold the Reorder icon to change the order of the child pages. This change is for all users with access to said pages. 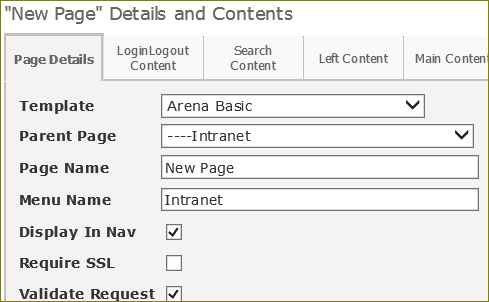 Arena clients can add new pages to further customize Arena for your organization. Before adding a new page with new information or a specific module, you need to decide where in your Page Hierarchy you want to add the new page. It is also important to know whenever you add a child page; the new page automatically inherits the template, page settings, modules, and security settings from parent page. Inheritance is only at the point of creation, meaning that if you add a module to a page that has child pages, the existing child pages do not inherit the new module. In this scenario, you can add each module manually to each child page. However, if you later add a child page, it inherits the module(s) from the parent page. Therefore, if you need to add new pages, the recommendation is to set the modules on the first page before adding other pages. 1. Click the page where you want to add a child page. This will be the Parent Page to the new child page. 2. Click the Child Pages tab. 3. If this is the first child page, click the Add link, or click the Add New Page icon if pages already exist. This automatically opens the Page Details tab of the new page. 4. Enter a Page Name and if applicable Menu Name for the new page. 5. Click the Update button. If there are multiple pages, click and hold the Reorder icon to move the page to the desired order. You are now ready to change/add modules to the page.